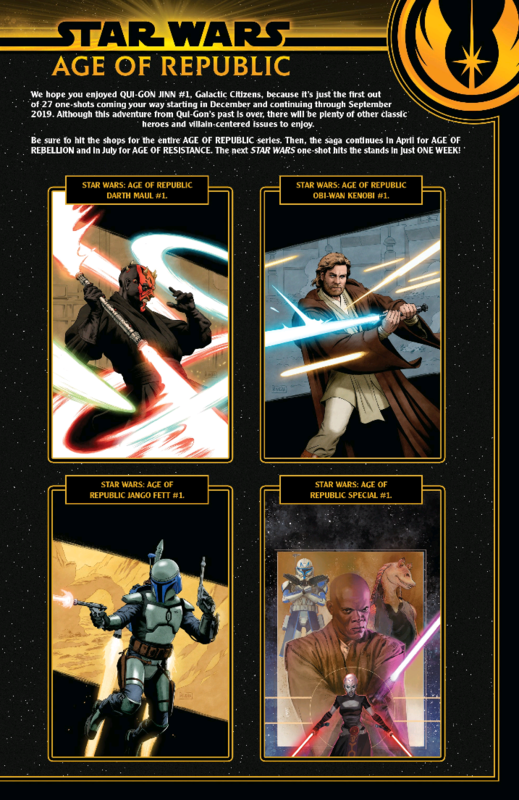 Discussion in 'Star Wars: Books & Comics + Legends' started by SWNN Probe, Dec 7, 2018. 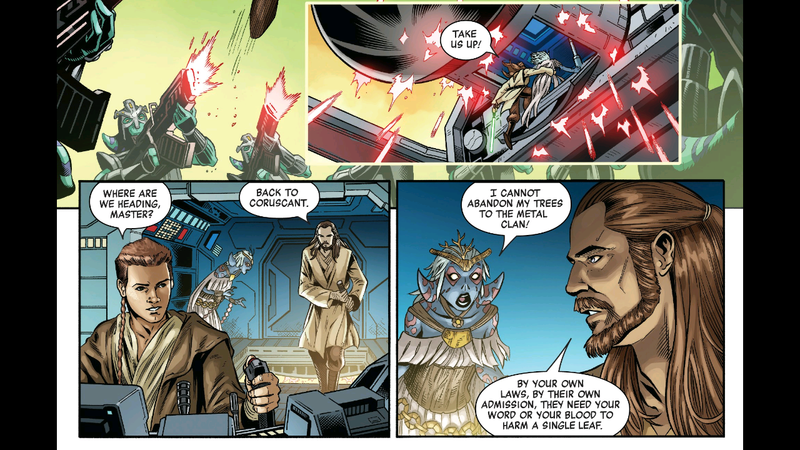 The story opens with Jedi Master Qui-Gon Jinn on the planet Bri’n attempting to help the locals arrive at a peaceful resolution to a dispute over the local flora. One group wanted to cut down the trees in favor of building a more civilized society while the other desired to preserve nature as it was intended to be. Unable to lead the people to compromise, the Jedi evacuated the “Priestess of Wood” to Coruscant for her own safety. The priestess was not happy to be taken away from her planet and hated Coruscant for the metropolitan abomination that it was. But all that is beside the point. 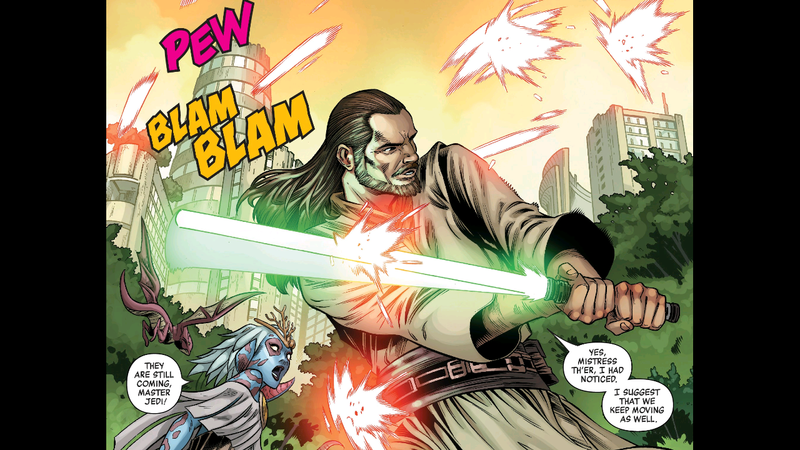 This story is not about the citizens of Bri’n – it’s about Qui-Gon himself and his internal struggle to reconcile his beliefs about the Force with his fears about what he and the entire Jedi Order was in danger of becoming. The Priestess of Wood was upset that Qui-Gon did not live up to her expectation of a great warrior that would side with her in her quarrel. It concerned him that there was little understanding of the Order’s purpose among the galaxy’s citizens. The Jedi were seen as soldiers of the Republic and servants of the politicians. As a student of the living Force, being used as a weapon for the Republic concerned the Jedi greatly, and he felt that they were beginning to lose sight of their true purpose as keepers of the peace and students of the Force. 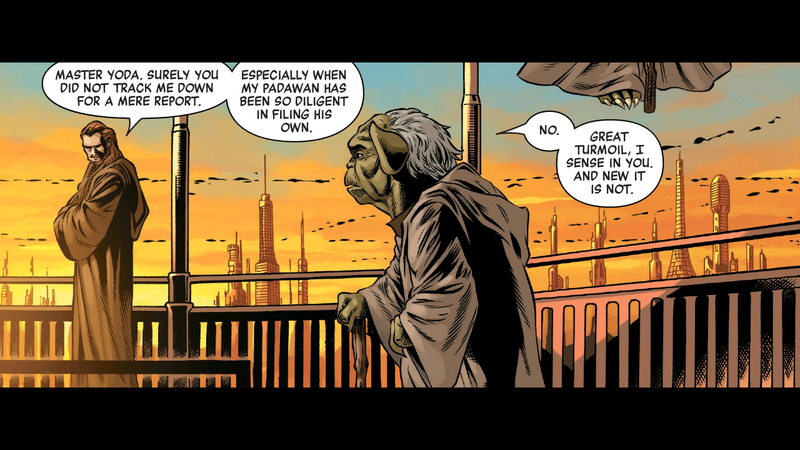 After venting his frustration, Master Yoda advised him that the council would not agree with him about his concerns but also expressed his desire to seek a deeper understanding about the matter through the Force. In this, at least, the two Jedi agreed. As a reader who knows the end of the story, it’s easy to see just how right Qui-Gon was in voicing his concern. The Jedi were becoming blinded by their own arrogance. In The Phantom Menace, it is clear that Qui-Gon is not always in agreement with the council, and it was interesting to see how early on his disenchantment with them actually began. We aren’t given an exact point on the timeline in the issue, but it seems to be at least a few years before The Phantom Menace based on Obi-Wan’s youthful appearance. 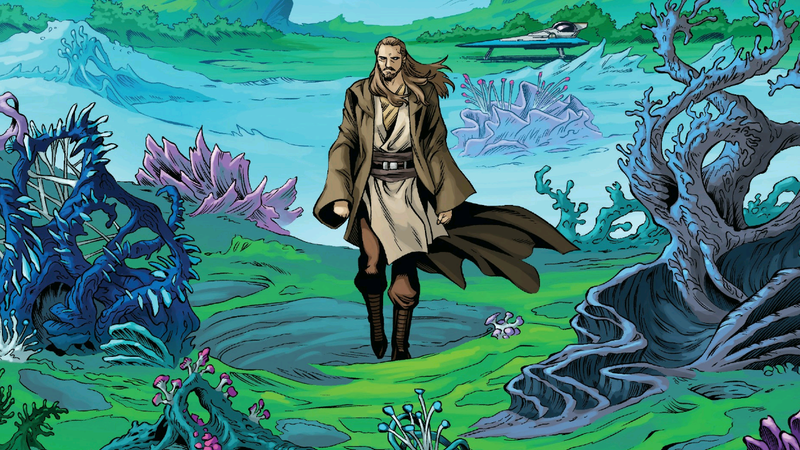 Seeking answers, Qui-Gon allows himself to be led completely by the Force to a distant world where he can commune with the Force while cut off from civilization. I originally thought this journey might take him to Dagobah, but he ends up on an unknown planet instead. 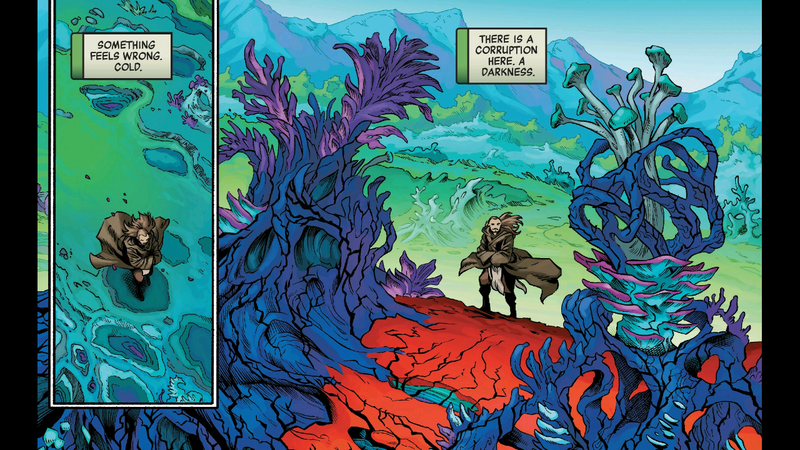 After making planetfall, he senses a growing darkness on the desolate world – a corruption. He wasn’t sure if he was sent there to stop it or to learn from it, but soon he would have an answer to his question. In a scene reminiscent of Luke’s dark encounter in the cave on Dagobah, Qui-Gon comes face to face with the dark side. 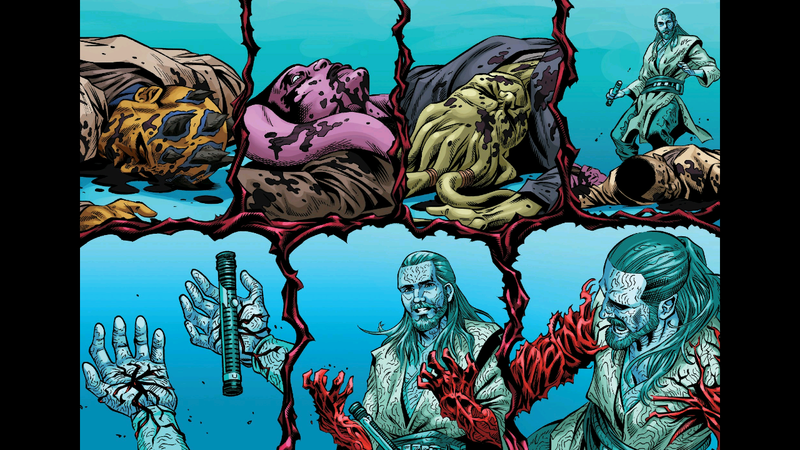 In an effort to defeat it, he receives a vision of only death and destruction at his own hands as a result, and by interpretation, the hands of the Jedi. The Order was heading down a dark path, and now, through the vision, his fears were confirmed. All was not clear, however, as learning the answer to his question left him with even more questions unanswered. Back on Coruscant, he convinces the priestess to seek a compromise with her people before convening with Yoda once again. Yoda tells Qui-Gon that having questions is a good thing, for it’s when one is certain of his understanding that he becomes arrogant, which is itself a path to the dark side. Qui-Gon muses that in one’s attempt to remain vigilant, there is also a danger of becoming too rigid. A tree unwilling to bend with the wind will snap after all. But Yoda cautions the Jedi about this line of thought as well. Always a threat, the darkness is ever present, and there is great danger in allowing one’s self to bend to its will. Qui-Gon clarifies that his statement was not about bending to the dark side, understanding that such a path would cause one to be consumed by the darkness. 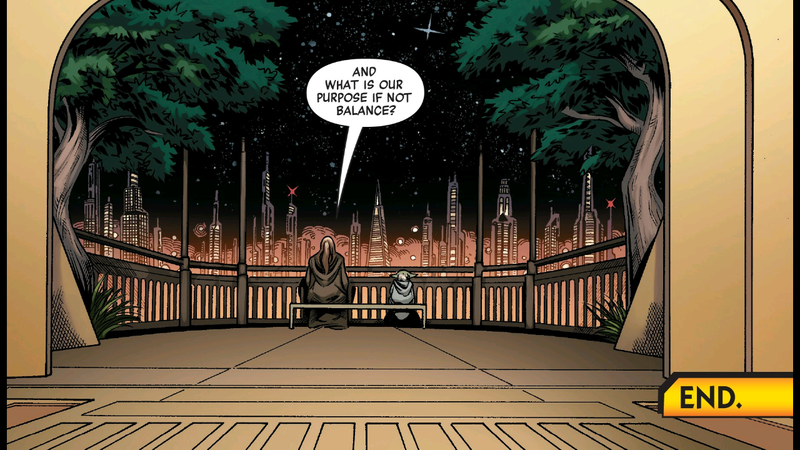 One of the answers that Qui-Gon found on his journey was that achieving balance in the Force is an absolute necessity in order to truly understand it, and, as he tells his master, achieving that balance is indeed the Jedi’s true purpose. 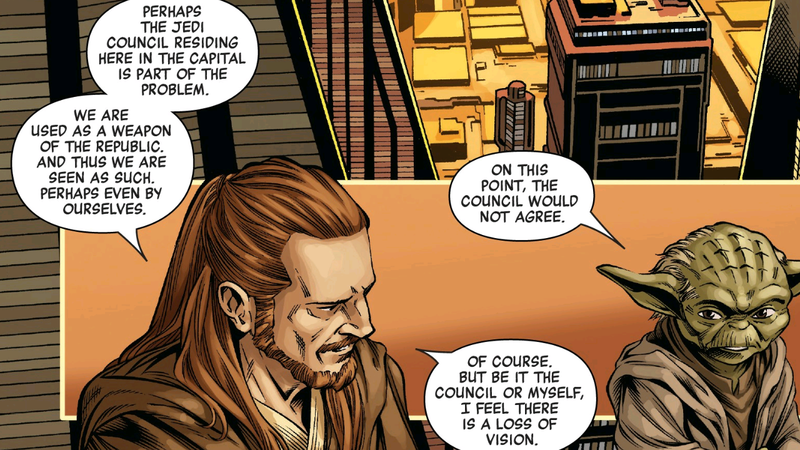 I really enjoyed the inside look at the mind of Qui-Gon in this issue. Houser did a great job conveying his motivation and tying those motivations to his character traits that we see on display in The Phantom Menace. While some fans prefer epic lightsaber fights or huge space battles, thought-provoking stories surrounding the Force like this have always provided some of the most fascinating Star Wars tales for me, and this issue has all of that philosophical goodness and more. It makes perfect sense that Qui-Gon was a student of the Force with the desire for balance. After all, he was the one who found the Chosen One, the one who, as the prophecy said, would restore balance to the Force. 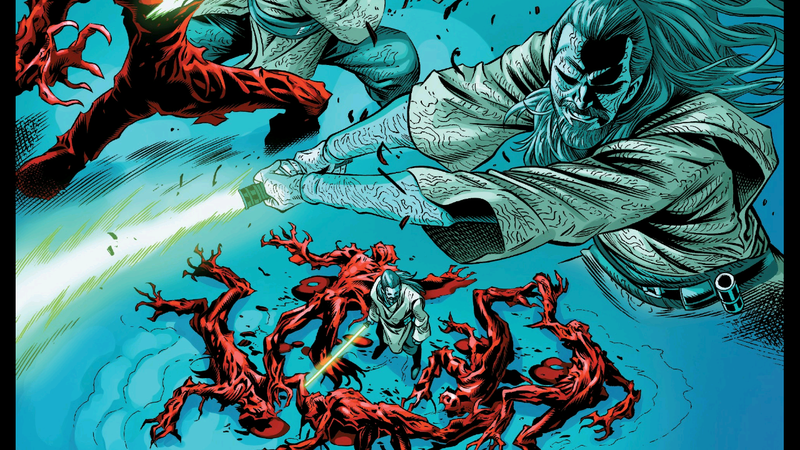 While his understanding of this prophecy may not have been complete, a retrospective look at the fall of the Jedi Order proves that he wasn’t wrong about the arrogance and loss of vision among the Jedi at least. I also find it very interesting that in the era of the First Order, Luke Skywalker adheres to a more balanced understanding of the Force. After discovering what led to the Jedi’s destruction through his communion with the spirits of Obi-Wan and Yoda, it’s easy to understand why Luke has adopted a more Qui-Gon-like view of the Force than his predecessors. Maybe the long-dead Jedi was right. It could be that his understanding of the Force in its proper balance is even what allowed him to retain his own autonomous identity in the netherworld of the Force, a feat that no other Jedi had yet accomplished. Perhaps Luke’s own understanding of this balance is what allowed him to project his spirit to the far away world of Crait in The Last Jedi. 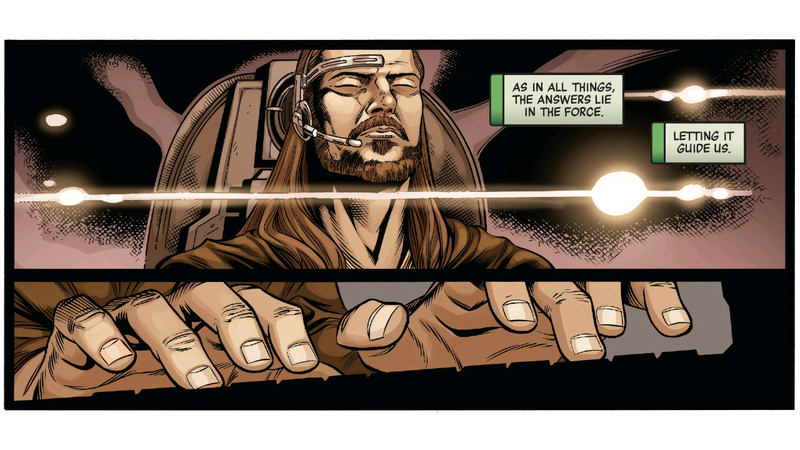 This issue, like Qui-Gon’s own journey, leaves readers with perhaps more questions than answers. But it was a great read and well worth your time, especially if you’re a fan of Qui-Gon or Force-related Star Wars stories. I can’t wait to read more of these one-shots, and after this issue I have to say the anthology series is off to a great start. If you prefer a more action-heavy run-of-the-mill Star Wars story, then you may not enjoy this one as much, but if you’re like me, you’ll love it. 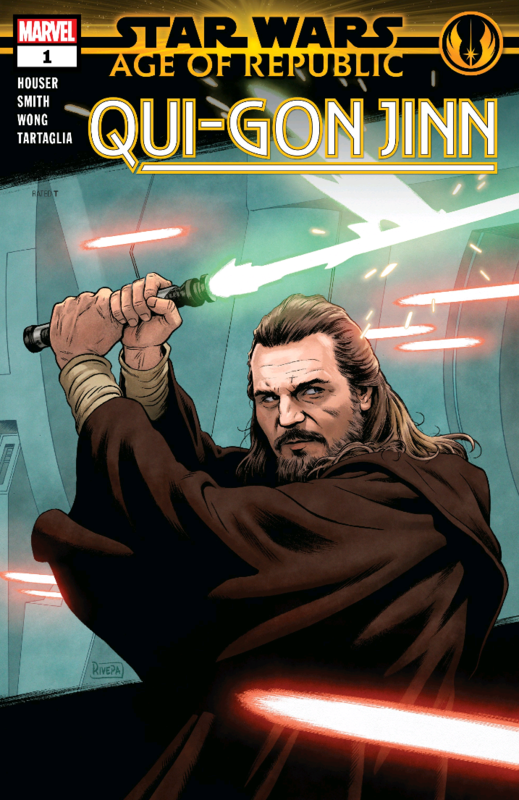 Star Wars: Age of Republic: Qui-Gon Jinn is available now in a comic shop near you or online at Comixology. Happy reading comic fans! Really cool cover. Looking forward to reading what these two got up to. Great review. I loved this issue. It just shows how Qui Gon is a key character and needs more development. This is cool. I think I will have to go pick it up. Finally something on Qui-Gon, my second fav character after Obi-Wan. This one was pretty decent. 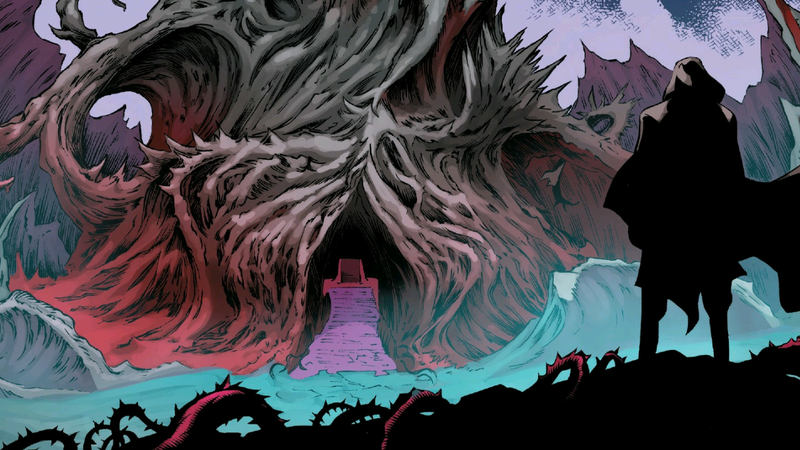 His vision was pretty neat and seeing him use what he learned from that to deal with the current situation with the Priestess of Wood. I want to see more of Qui-Gon; he’s such an interresting, underrated character. It was cool seeing him interact with Yoda (which we’ve only seen him do posthumously in canon) and as a huge Clone Wars nerd, it was cool seeing that Jedi Shuttle appear again.